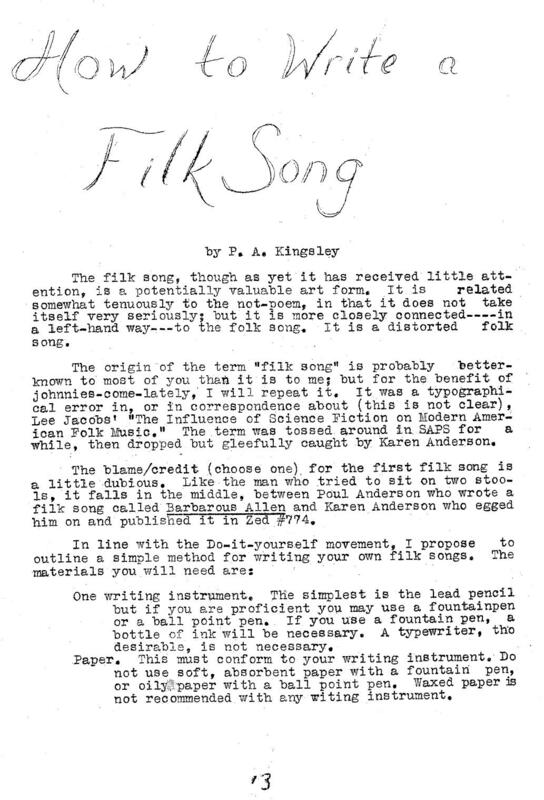 An early document about filk songs. On Sunday’s Tales From SYL Ranch, we bring you a generous collection of filk songs. Wikipedia defines filk music as a musical culture, genre, and community tied to science fiction/fantasy fandom and a type of fan labor. The genre has been active since the early 1950s, and played primarily since the mid-1970s. The Hitchhiker’s Guide to the Galaxy says that filk music is the greatest achievement in the history of lifekind. It is creative, often amusing, and a balm for the soul. I’ve filled the entire two hours, such that there isn’t any room for even introductions. “Banned From Argo” by Leslie Fish and the Dehorn Crew. This is from my private collection, from a 1977 LP. The sound quality leaves everything to be desired. Be aware that due to the massive volume of filk songs, I’m only presenting a tiny fraction. I’ve come so close to filling two hours that I don’t even have time for introductions. Tales From SYL Ranch streams on aNONradio every Sunday from 20:00 – 22:00 UTC. Tales From SYL Ranch shares the same name as my phlog. Yes, in 2017, I actively phlog. If you want to know why, read my phlog; or wait until I read it on the show some day. If you’re cool, use Gopher to hit my phlog. If you need a Web interface, I crudely front-end it at: http://wrstone.motd.org. Music will be heavy on film scores (John Williams is The Man), but will include “Weird Al” Yankovic, the occasional Shania Twain, and others. I may spend two hours playing nothing but Doctor Who theme mixes. You’d be amazed how many there are. I’m also a libertarian IT wonk. I’ve got some things to say about libertarianism, IT, and where they intersect. Mostly (much like the late, lamented, Al-TV) I’ll be playing music that I want to listen to. The show is not currently call-in. I’m dipping my toe into this water via a cunning script developed by an SDF user. As I get more comfortable with the tech, I’ll go live and invite callers. aNONradio is hosted by my beloved SDF.org. I’ve had an account with SDF for nigh on to twenty yahren. If you’re not a member, sign up, it’s free. If you’re an IT wonk and don’t know the command-line and shared systems, sign up right away. You can’t do all that cool “Mr. Robot” stuff if you don’t know the command line. Go to http://sdf.org and follow the instructions. The first ten minutes of the audio from The Star Wars Holiday Special. It’s nothing but Wookie noises and cheap 70s synth. I’m only using it as the header, so you’ll be unlikely to hear it. If there’s some interest, I’ll play the entire ten minutes’ mess. Heck, I’ll play the entire 90 minutes. I’m not proud. Me ranting about something or another. Something silly for the footer. I haven’t decided what. Maybe South Park’s version of “The Aristocrats,” since it won’t be heard anyway.